This week we talk about some of the chords that we dread seeing when we are playing and improvising. We all have them, we all hate them. The good news is, we can learn to play over them just like the easy chords that we feel most free over. The key to this is being as familiar with tough keys as we are with easy ones. This requires more time and effort because they don’t come as easily to us as we would like. As always in jazz, learning all 12 keys of something is important. But what if we spread those 12 keys over weeks and months instead of trying to cram them all in to an hour of practicing? This is a game changer. 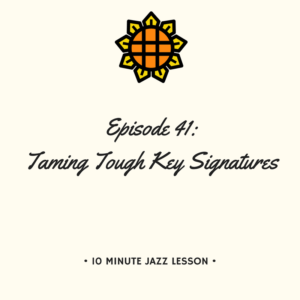 This episode is packed with exercises to work on that will make you fly around the tough keys with ease! As always, go slow, take your time, and you will start to see this stuff pay off in a relatively short amount of time. Good luck!